I did not s tart the day with a workout. I was actually very tired and you have to keep your strength up if you are to hang on during a session with Mat Newman. So I slept as long as I could and headed off to the conference hotel. Mat Newman is a character that everybody in the community, and at the conference, knows. 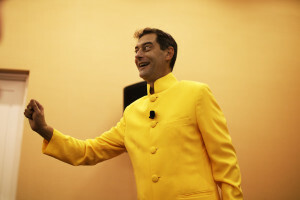 He’s impossible to miss in his yellow suit, with matching shoes and wrist watch. Newman is also a born showman, and he loves the technologies IBM provides. I’ve written and said this before, but Mat has been a huge source of inspiration for me when it comes to both user training, as well as preaching about Notes/Domino and Connections (and other tools and technologies that I like for that matter). Mat presented a user case scenario where a user went from having dozens of copies of the same file, which were emailed all over the place, to taking control over the work process so that she only had to contend with one copy, which she then shared across with those who wanted it. We didn’t exactly learn something new here, but Mat’s conviction made a lot of us feel that this is what we should go home and tell our boss, our colleagues, our competitors, our friends, their grandmothers and their dogs. I spoke to several people after the session, and we all concurred that if IBM had more Mat Newmans, people would not be moving to other platforms. And I got a great idea (at least I think it’s great) on what to do with the Norwegian IBM Users Group’s spring seminar in May. Stay tuned! The title of this presentation was a bit misleading, because we are talking about Sweden only. But if their claims are true, it’s still pretty impressive to get a 100% adoption rate from their users. But that was their point: They didn’t adapt their users. They adapted the technology to fit their users need. So they took IBM Connections and put their own product on top to skin Connections to become more of a web page (intranet) where users find what they are looking for, instead of wading through things they don’t understand (wikis, blogs, forums and so on). This seems to be a predominating theme: To achieve user participation, you need to skin Connections. Hopefully the new design of Connections 5.5 will make this need smaller. I will definitely check out this product, and during the Nordic dinner, I spoke to one of the product managers from the Swedish company. IBM has a big user community with developers who are really the ones driving the technology and solutions forward. IBM acknowledge this and both reward people with the IBM Champions price, as well as giving them the possibility to speak at the conference. Even though we have lost a lot of the old timers among the gurus, there still are a lot of them, and they are all willing to share what they know. There was a pretty big turnout, but I do get the feeling that those who don’t come to this session stay away because they feel this is a club, where everybody knows each other, so they feel left out. Personally I was welcomed with open arms in to this community back in 2006 (thanks to Bruce Elgort who saw me at an OpenNTF session and wanted to know who the new guy was). I think maybe the gurus should think a little bit about that, especially with the internal jokes going on. It’s also a bit hard for some people to know the difference between this session and the ASK the developers anbd Product Managers session. The most important thing that came out of this session was that we turned the focus on the user groups. Some don’t exist any more, some are thriving and others are struggling. I hope more people came out of the session and were ready for start turning up at the user group meetings. Or even engage themselves in organising them. I asked a question about the Files plugin in IBM Notes and I was told that, yes, it will be developed on more. So that’s good news! Liz Urheim, Vice Precident of Collaboration and Smarter Workforce, summerised the week and promised us that, yes, there will be a conference again next year! Inhi Cho Suh then took the stage. She is the General Manager of collaboration solutions for IBM and her words on their commitment to developing all the platforms of IBM is still strong. I liked her talk. It was short and to the point. Erik Wahl then took the stage. He is an artist who has made a career of letting go of traditional thought patterns. During the presentation he painted pictures and talked about encouraging people to use disruptive strategies. Let the kids colour outside the lines. And he asked: “Why is it that when I ask pre school children if they can draw, they all say ‘yes,’ but when I ask adults, almost all of them say ‘no. '” When do we lose that? Food for thought. And that was it. In the evening IBM Norway treated us to dinner at Kimonos, which is a at the Swan and Dolphin hotel where this conference used to be held. Sushi, beer, nostalgia, karaoke with Mat Newman made the whole evening in to very enjoyable event. And that’s how I feel about the entire conference! Last year it was all doom and gloom. This year the vibe was much more positive. IBM seems determined to deliver what they promise, features that have been requested, both in Notes/Domino and Connections are coming fast, the plugins (which I love) are getting more and more love and there were some really good sessions this year. For me personally I got to meet friends again, but most importantly: I got to have meetings that will probably result in my employer saving time and money, as well as becoming a more effective and collaborative organisation. I’ve also received loads of great feedback, both about my blogging from the conference, and my contributions to the community. Oh yeah, the weather was great too. Thanks to IBM for buying that weather company! Never noticed your blog before, good writing and thaughts. You will see my IP in GA from now on. If you want to know more about Salvation Army, we have posted some on our blog statusraden.se. Hope to see you again.